I am a singer songwriter who is trying to make a living singer songwritering. In order to do that it is necessary that I tour. I like touring, so this is no problem. But I happen to have a lovely wife who, for good good reason, doesn’t want me to be not-at-home for half-my-life. So, this was a big ole problem. I need to tour, but I can’t go away to do it. The thought to tour the Northeast came on pretty fast, and when it did I felt very stupid that I hadn’t thought of it before. I live in New York City, and within a few hours of here are Philly, Boston, DC and Baltimore. I started wondering if I might be able to play these cities and get back the same night to sleep in my own bed. This would please my wife, and it would also subtract a major expense from a tour budget, as I would not have to pay for any lodging. This sounded pretty great to me, but there was still one problem left to solve, which was how to get o these cities and back. Being a New Yorker I don’t own a car, and I also know that train tickets between these cities ain’t exactly cheap. So I turned to buses, and my problem was virtually solved. Specifically, I began searching the schedules and routes of Megabus. I’d seen plenty of big ole Megabus buses out in Midtown with ads on their sides touting one dollar fares to all the cities I wanted to go to. I like one dollar fares. 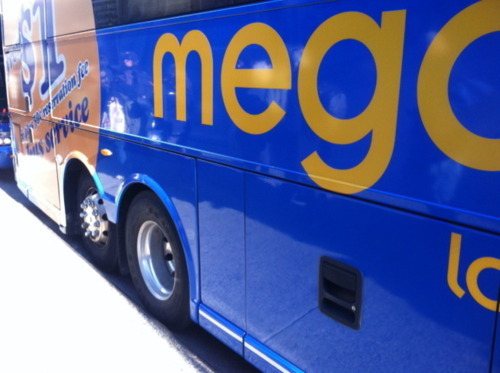 So I went to Megabus.com and looked at where and when they went, and realized that I was basically looking at my new tour route. Especially as most of the cities I need to get to have a midnight Megabus back to New York. So, I began writing to venues in these cities, and now the tour has begun. On Tuesday and the following Tuesday I’ll ride to Boston and back in the same day. And this Wednesday I’ll be in DC. The total transport cost (excluding local subways) for three round trips was something like $40. In short, not only am I very excited to be “touring,” and excited that my marriage will not suffer from it, but I am feeling sort of like a genius because I’ve essentially cut out the two major expenses of touring in general: lodging and transportation. If I sell 3 CDs on my WHOLE December schedule, I will have covered my costs. Pretty cool.